Inspired by butter crocks used in the days before refrigeration, our 3-pc. 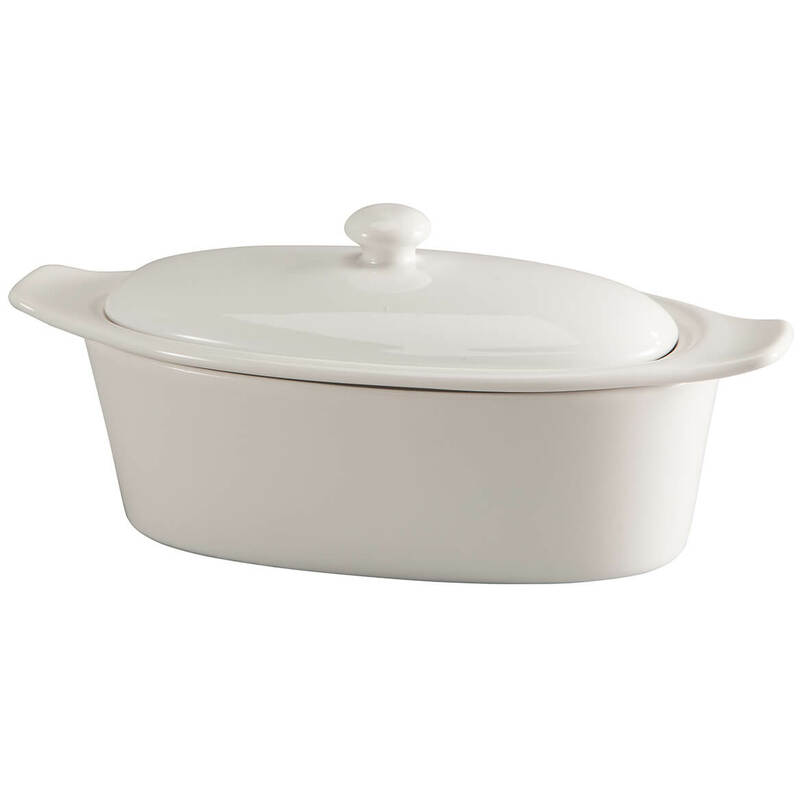 white stoneware butter keeper boasts timeless style in shiny white stoneware. Designed to block out air and keep a stick of butter soft without melting, it assures your butter will stay fresh and easily spreadable for toast, English muffins, dinner rolls and more. Simply fill base with cool water, add a standard-size stick of butter, and top with lid to create an airtight seal, keeping butter soft and fresh on the countertop. The 3-pc. butter dish set is dishwasher and microwave safe. 8 1/2″ long x 4″ wide x 4″ high. Complete with their own handy vacuum pump, these Seal’In 9-pc. 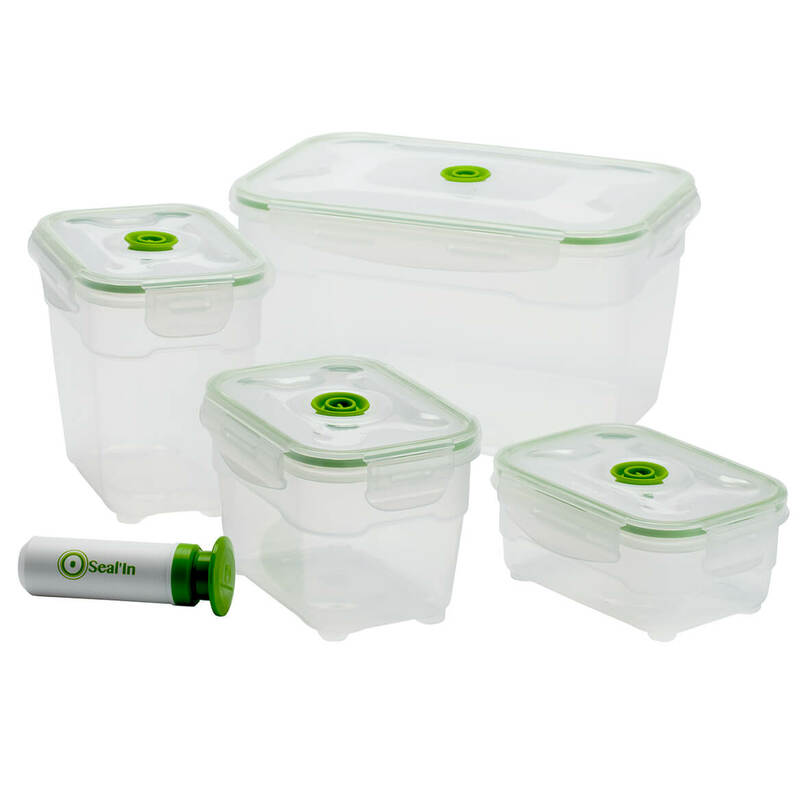 Nestable Storage Containers each have a patented silicone valve—allowing you to pump out excess air so food stays fresher longer! Opening easily and closing tightly with side clips, the plastic containers store food in pantry, fridge or freezer, and can be used with or without lids in the microwave (when used with lids, valves allow steam to escape). Nesting for space-saving storage when not in use, the 9-pc. set includes 1 vacuum sealer pump plus 4 containers and 4 lids in these versatile sizes: 600 ml (20 oz. ), 1.0L (1.1 qt. ), 1.4 L (1.5 qt.) & 4.7 L (5.0 qt.). Made from durable, BPA-free polycarbonate; dishwasher safe. 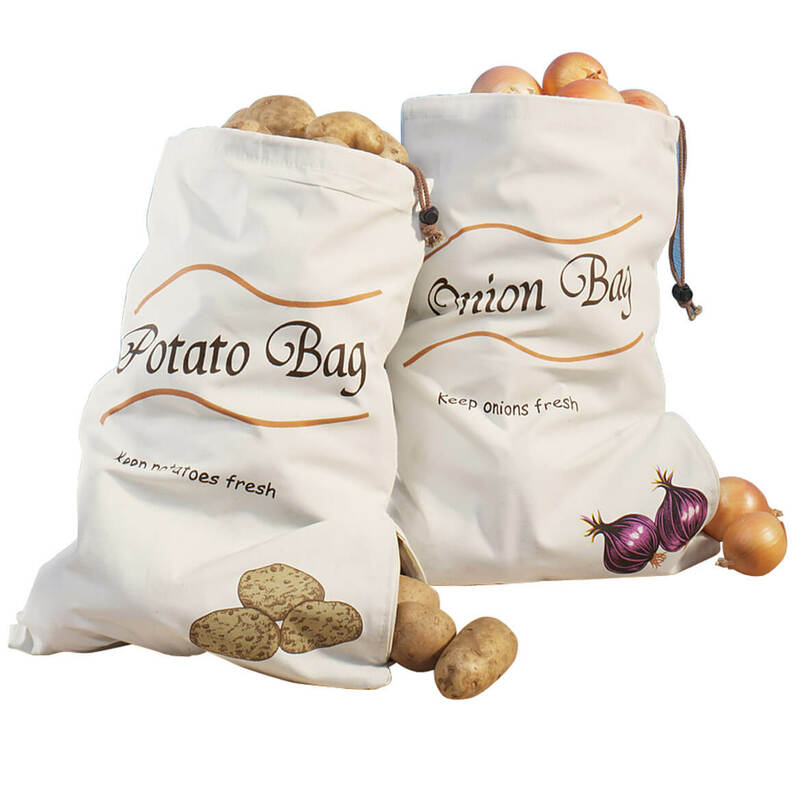 Generous canvas sprout-free vegetable bags feature special “blackout” lining, which absorbs moisture and obstructs light – keeping potatoes and onions fresh! Reusable cotton/poly bags feature drawstring tops for easy loading. Simply remove veggie from zippered side opening of the bags to automatically rotate stock. Set includes two 10-pound reusable vegetable bags. 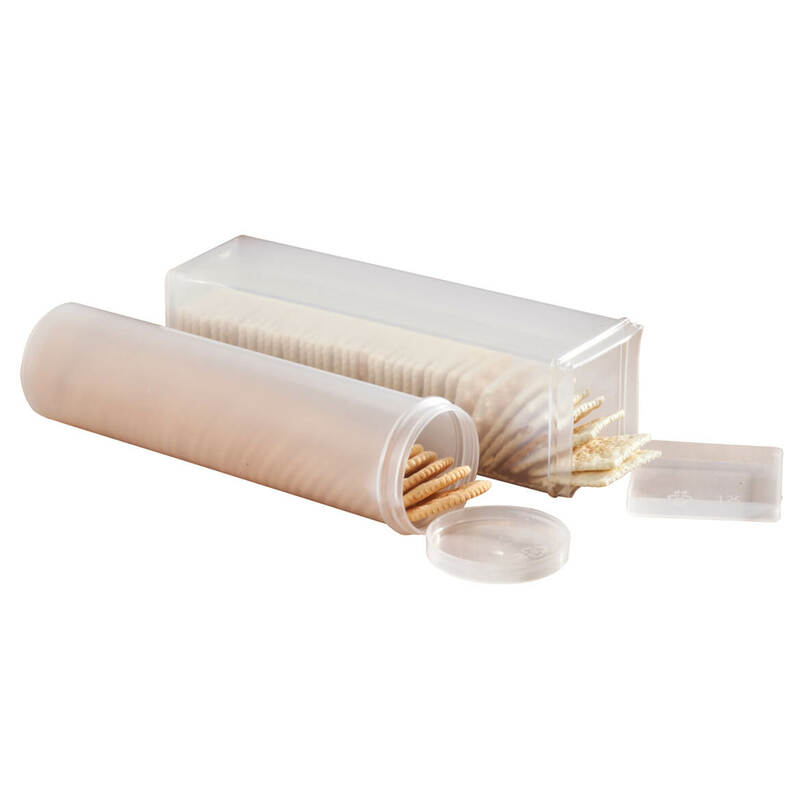 Perfectly shaped for your favorite crackers, this set of square and round cracker keepers preserve freshness with snap-tight lids. Clear design offers quick, at-a-glance identification for easy storage in the cupboard or pantry. Hard plastic exteriors protect delicate contents from crushing, making these food storage containers great for travel, camping or on-the-go munching. Dishwasher safe. Round keeper measures 9 1/2″ long x 2 1/2″ dia. ; square keeper measures 2 3/4″ long x 2 3/4″ wide x 9 1/2″ high. 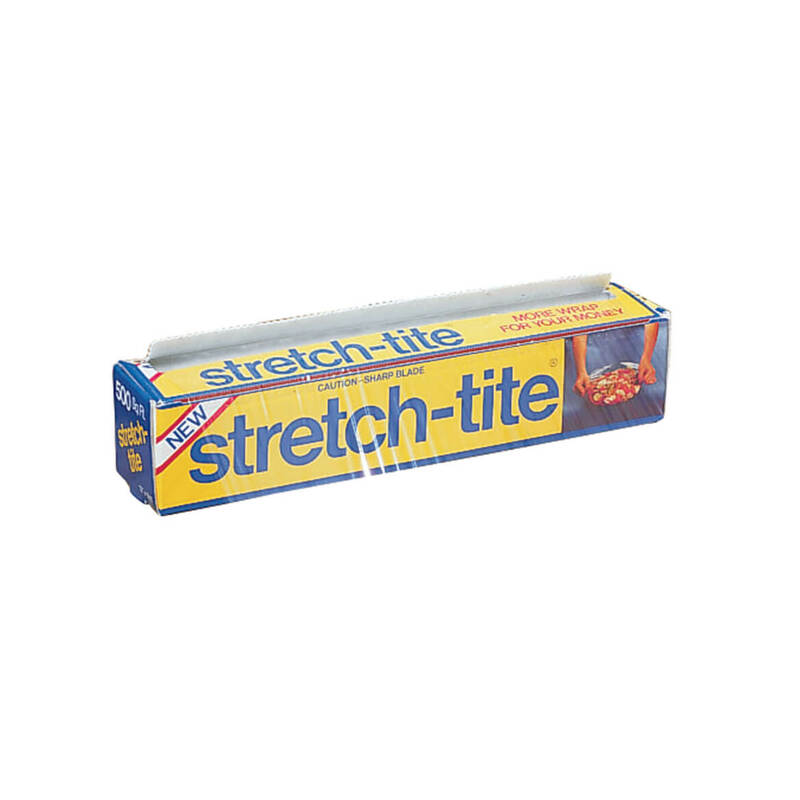 Stretch-Tite® premium plastic food wrap really stretches and clings in your fridge. This plastic wrap keeps containers sealed. Great for your microwave too. 11 5/8″ x 516′ roll. 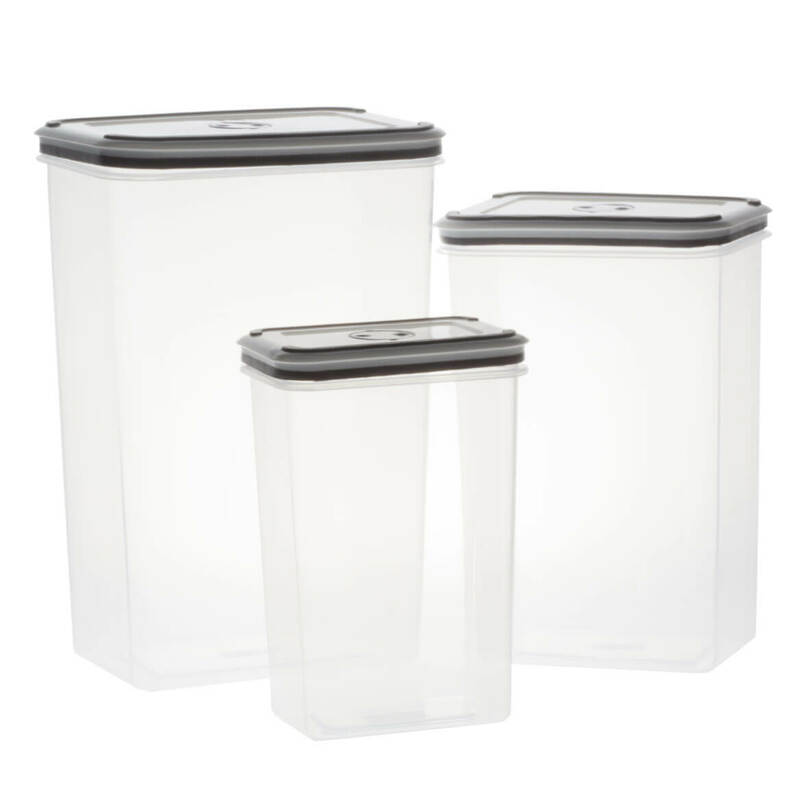 This generous see-through sugar keeper stores a 5 pound bag of baking staples; hinged, snap-tight lids keep them fresh and recipe-ready. 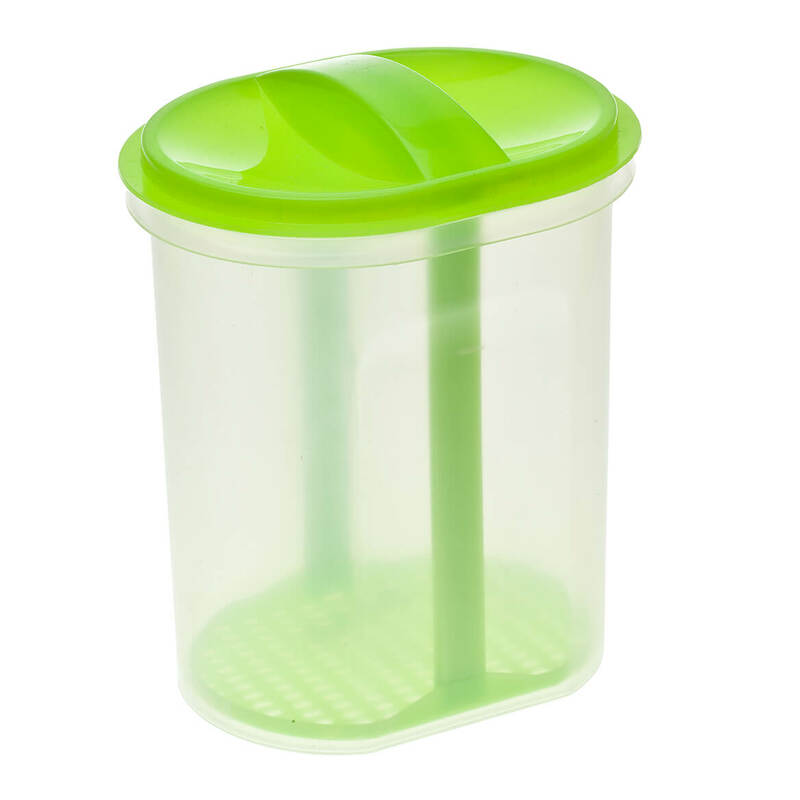 Place unused portion (still in the bag) inside the sugar holder, or pour balance directly into this dishwasher-safe, plastic sugar container. 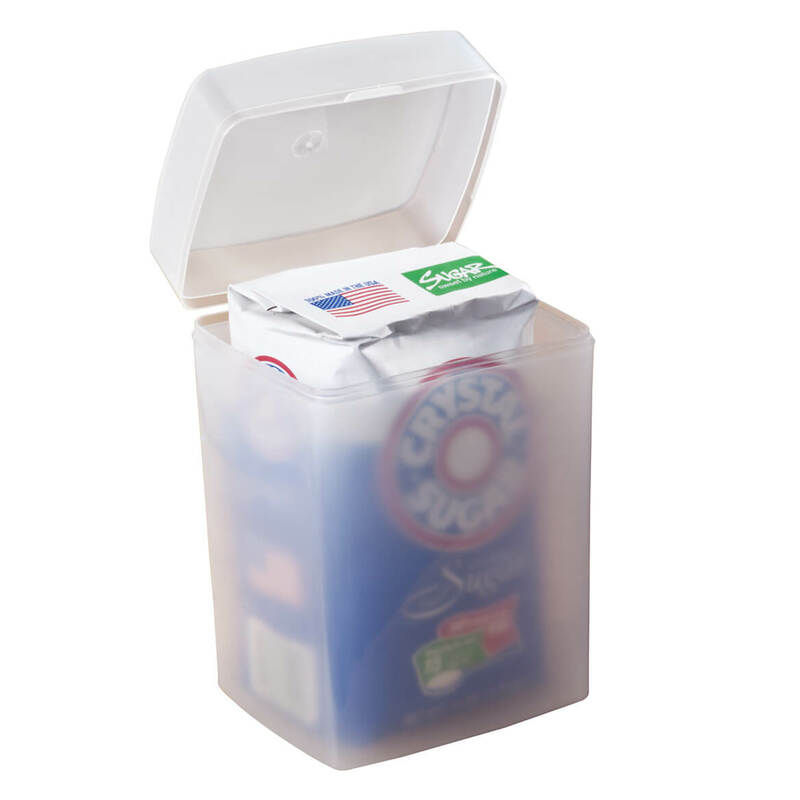 Sugar storage container measures 5″ long x 4″ wide x 7 7/8″ high. A streamlined alternative to large, bulky packaging, this tall food storage container set provides generous, space-saving storage for cereal, pasta, flour, sugar and more. Each clear plastic container lets you easily identify contents and supply levels at a glance, and each includes a tight-fitting snap-on lid for airtight freshness. Set of 3 food containers includes 40-oz., 80-oz. and 142-oz. containers with lids. Dishwasher safe. Storing veggies upright in water for extended freshness, this two-section veggie holder’s lift-out strainer lets you grab a crisp, healthy snack without dunking your fingers! Perfect for fridge or cooler, each two-section vegetable stand features airtight, snap-on lid with built-in handle. Helping you snack smarter and SHOP smarter, the value-priced vegetable holder set includes 2 veggie stands, 2 lids and 2 lift-out strainers. Dishwasher-safe plastic. 5 1/2″ long x 4 1/2″ wide x 6 3/4″ high. 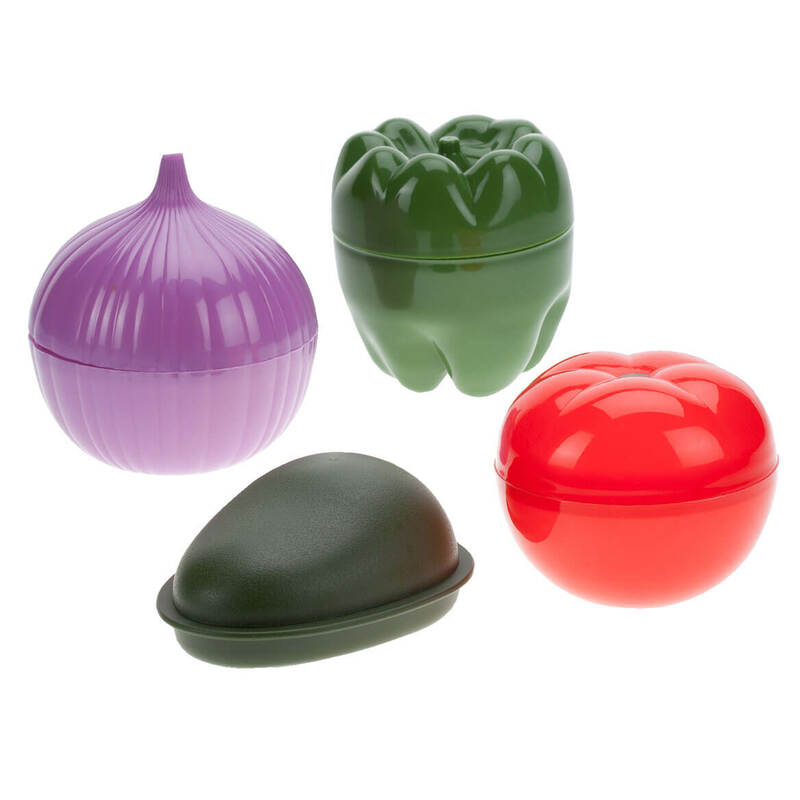 Keep produce firm, fresh and flavorful with this airtight vegetable keeper set. Designed in fun veggie shapes, they’re easy to identify contents and spot in the fridge. Twist-lock lid helps keep odors out while sealing in flavor and texture, helping prevent food waste and extending the life of your favorite produce. Plastic; dishwasher safe. Set of 4 includes onion (4 1/2″ high x 4 1/2″ dia. ), green pepper (4 1/2″ high x 3 1/2″ dia. ), avocado (5 1/2″ long x 4″ wide x 2 1/2″ high) and tomato (3 1/2″ high x 3 1/2″ dia.) food containers. With this pie keeper, your desserts stay moist and delicious in this hinged-lid pie storage container. It’s deep enough to accommodate tall meringues or fancy cream pies. 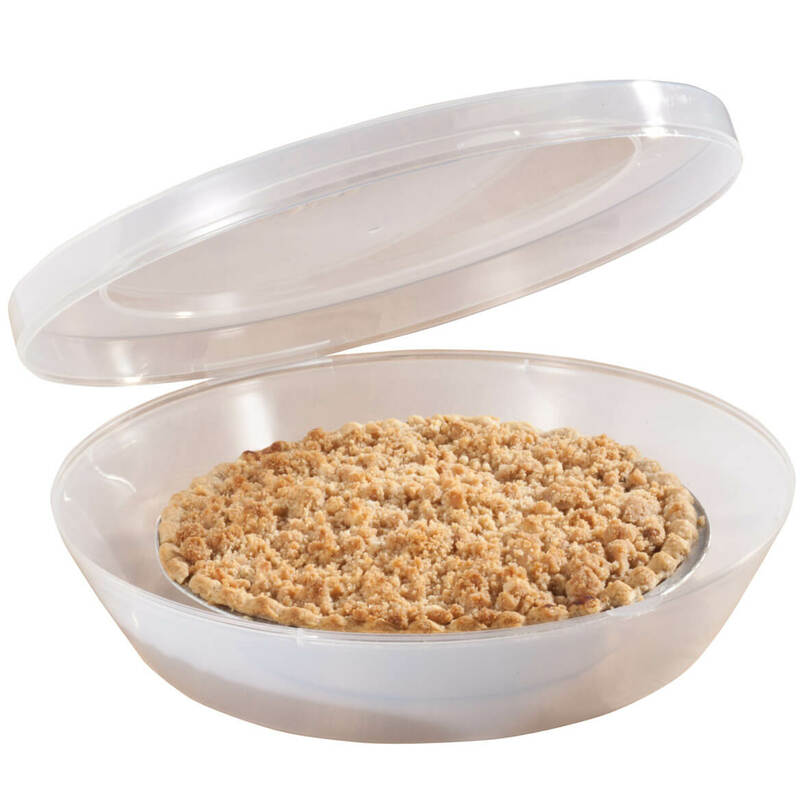 In durable plastic, the pie container holds up to an 11″ glass or metal pie plate in fridge or freezer, keeping air out and freshness in. Pie carrier is dishwasher safe. 3 1/4″ high x 11 3/4″ diameter.